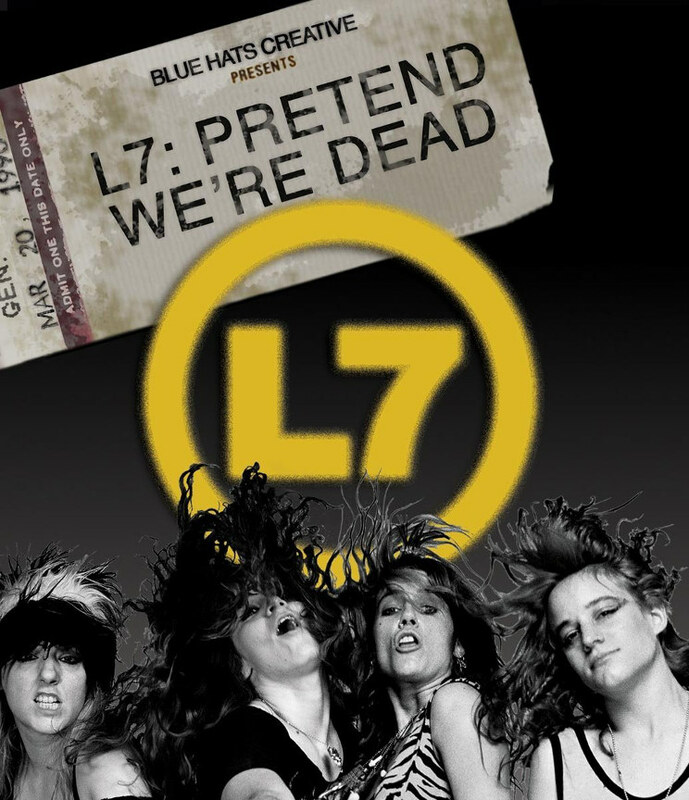 The L7 documentary Pretend We’re Dead has finally been unleashed on “home video” in the States (and on Amazon video, here in the UK)… though, as a backer of the initial Kickstarter campaign, I actually received my (signed) copy a couple weeks ago, and watched an exclusive online stream of an earlier edit several months back. I’m not sure how much appeal the film will hold for people entirely unfamiliar with the band and their music, but as a long-time fan I found it fascinating, and loved all the old-timey video/film footage that the doc’s director, Sarah Price, managed to assemble to illustrate their “rags-to-riches-to-rags-again” story… alongside specially-recorded interview snippets with the likes of Joan Jett, Shirley Manson, and CSS testifying to the importance/awesomeness of our out-spoken, hard-rockin’ heroines. If nothing else, it’s a salutary lesson that fame and fortune don’t always go hand-in-hand, and that an artist can be both “ahead of their time, and behind on their rent”! Besides the main feature, there’s also 30 minutes of bonus on-tour “home movie”-type footage, and “L7: The Beauty Process” (1998), a 45-minute pseudo-documentary directed by Krist Novoselic (of Nirvana fame), comprising scripted/semi-improvised (?) skits and live performance footage. Although the Blu-Ray disc included in the dual-format retail release seems a bit superfluous, as it doesn’t contain any extra features, and the documentary itself is mostly comprised of low-definition archive footage, the set is a total steal at just $16! SPOILER: I think Slap-Happy (1999) is a great album… in fact, I still have the T-shirt, and often wear it around this time of year due to its Halloween-y artwork… so it broke my heart to learn that it was such a commercial flop, and that all of the unsold copies were unceremoniously buried in a landfill pit. Harsh! This entry was posted in Rants about Films, Rants about Music and tagged CSS, Joan Jett, L7, Pretend We're Dead, Sarah Price, Shirley Manson, Slap Happy, The Beauty Process. Bookmark the permalink.